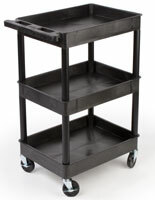 Looking to improve your barber shop and drum up more customers? 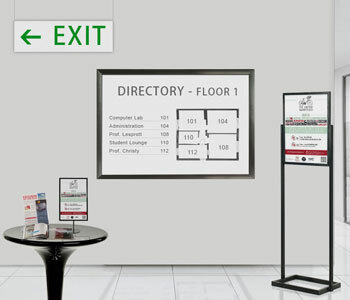 This hand-picked collection of barber shop displays includes everything from custom-printed banners to furniture for your waiting area. 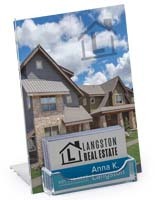 Get everything you need for both indoor and outdoor advertising in one place while saving with low, wholesale prices. 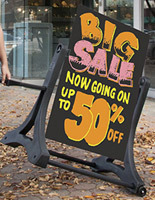 You can pick up a sidewalk sign with a changeable letter board to create unique messages about promotions or specials or you get a simple business card holder for your service counter. 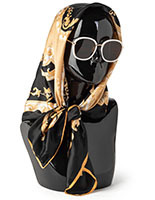 (Or maybe you want both!) Either way, we've got you covered. 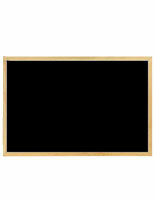 More Bulletin Surface Color Options Available! 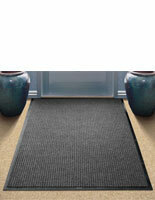 More Color & Rug Size Options Available! Running a barber shop is tougher than it looks because there is so much that goes on behind the scenes that customers don't see. A lot of shops feature just one or a couple stylists, so there's plenty of work beyond just cutting hair. Many barbers also have to handle transactions, pay bills, and clean up their shops. 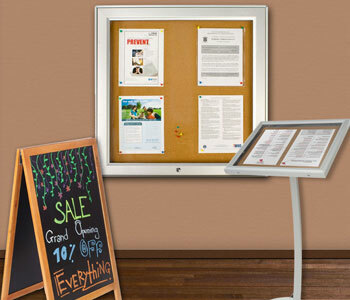 After a while, these responsibilities start to add up, so who has time to think about barber shop displays? We do! 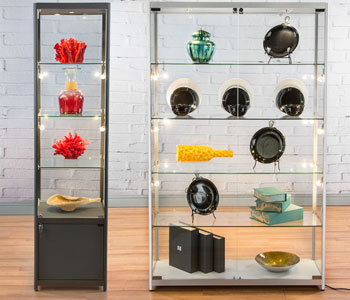 We've done all the work for you, so instead of scouring our online catalog for the supplies that suit your shop you can find them all right here! 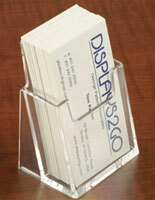 Let's start with the displays people commonly associate with barbers. 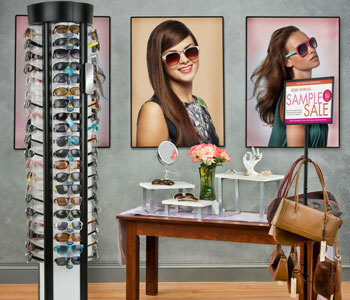 The barber shop pole is by far the most wide recognized fixture used at these types of locations. 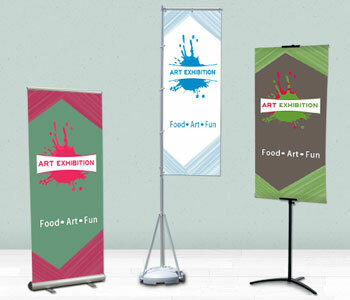 While we don't carry these fancy vintage poles, we do carry all kinds of custom printed banners and flags. 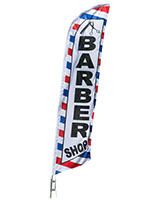 The ability to customize these pennants allows barbers to brand their shops and grab attention from passersby. 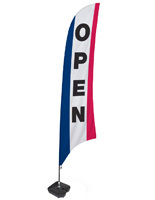 We also offer a wide range of stock banners that announce "Open", "Grand Opening", "Sale", and other messages. 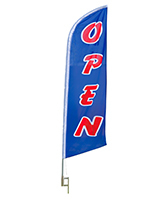 There's a barber shop flag for everyone at Displays2go simply because we offer both generic and customized banner options. 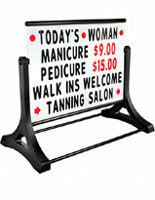 Lots of businesses also use barber shop sidewalk signs to attract more business. 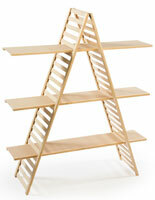 Each design is different, but they all offer one similar feature: the ability to customize. 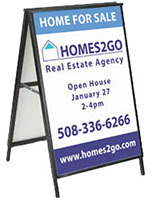 Shop marker boards, letter boards, or standard poster holders. The only difference is how you create your message. Once you've gotten your prospective customers to schedule a haircut and come inside, you'll want to keep them entertained. 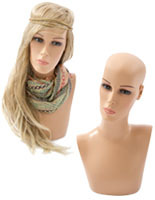 Customers love to change up their hairstyles because getting your hair cut is such a fun, transformative experience. But waiting your turn at the barber shop...not so much! Barbers and hairstylists can improve the overall experience for their customers simply by offering a little entertainment. 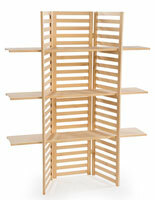 Magazine racks are a staple for any waiting area but are especially useful for barber shops. 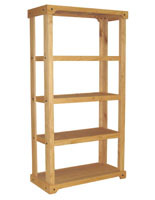 Pick up any one of our wooden, metal, or plastic literature racks and fill with all the latest publications (emphasis on "latest" because no one likes to read an issue of TIME from March of '91). 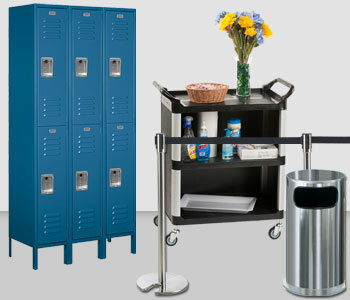 We even offer a unique collection of lobby furniture, including end tables and coffee tables, that incorporate literature pockets right into the design. 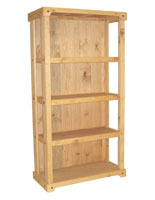 Buying a magazine rack end table is a great way to save money since the fixture will serve not just one but two different purposes. 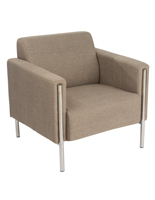 Comfortable waiting room chairs are often overlooked, many times just for the sake of saving a few dollars. 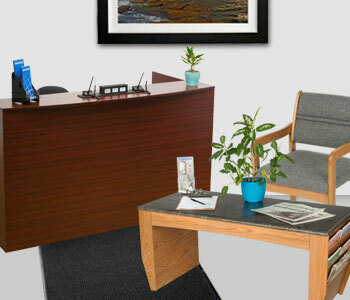 Believe it or not, using more comfortable chairs in your waiting area leaves a larger impact on customers than you might think so it's usually well worth the additional cost. Need even more entertainment? 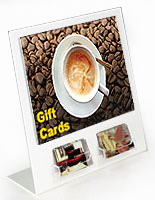 Consider a digital signage package so you can tailor slides that showcase your shop's capabilities and specialties. 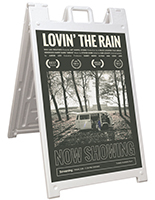 Many of the digital signage TV monitors can be programmed to show regular broadcasting as well, so it's a win-win. 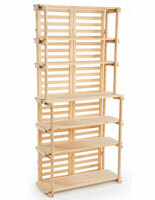 Just make sure to mount the TV with the appropriate stand or mount, so the screen and your customers are kept safe. 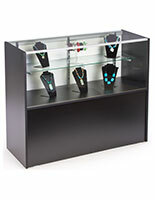 Barber shop shelving and display cases are great for any location that sells hair products. 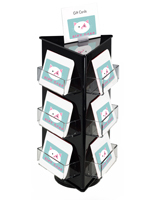 Present shampoo, beard oil, moustache wax, trimmers, and other retail supplies in a professional way with any one of our merchandise shelves. 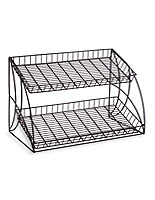 Our high quality shelving comes in a variety of designs, but wire and wood options are some of the most popular among hairstylists simply because they are so durable yet are light enough to move without a struggle. 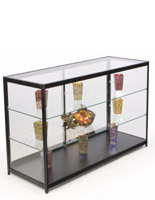 For a more permanent merchandising solutions, try out a glass display case. 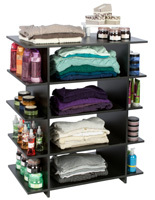 You can line up several rows of hair products and accessories with ease with a floor-standing, countertop, or wall mounted display cabinet. Many barbers have old antique tools that are on display in their shops as well. 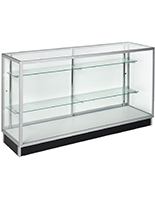 This is a perfect opportunity to use a glass showcase because it makes the items look very professional yet keeps them protected. 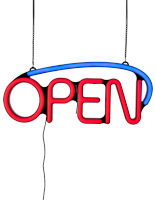 You've probably got your actual barber shop supplies covered, but you'll want to pick up other less specific fixtures we offer too. 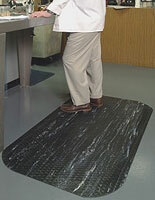 Think about when the customer is all done and goes to pay. 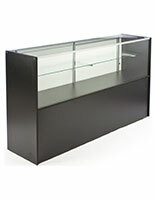 What store fixtures might come in handy? 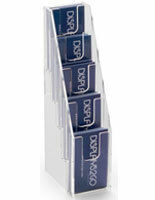 Cash register stands and checkout counters for barber shops are available in a full array of designs and sizes. 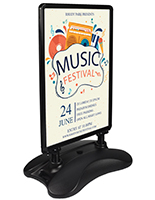 Some even feature customizable panels on the front that can be used for supplemental branding or seasonal advertising (think prom or wedding season!). 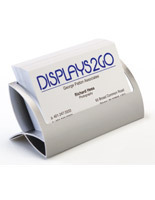 Once your service counter is set up, you'll want to place a few sign holders on top with pricing or other information. 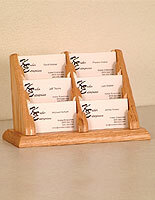 Business card holders are the perfect countertop fixture. 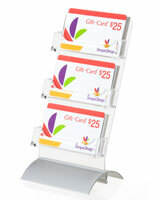 As customers pay, they'll see your calling cards and remember to grab one before leaving. This way, they can easily pull out the card and schedule their next haircut when the time comes. 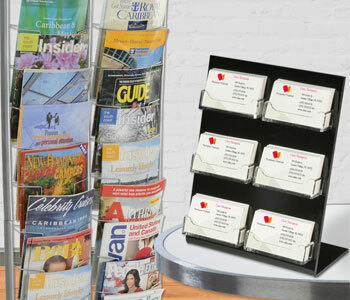 It's not often that you can do something so small and get such a big impact out of it, so why not get a calling card dispenser to boost return visits? This assortment of helpful barber displays is sure to help complete your shop's look and functionality. 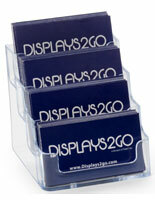 Take advantage of one-stop shopping and low prices every day at Displays2go.com!